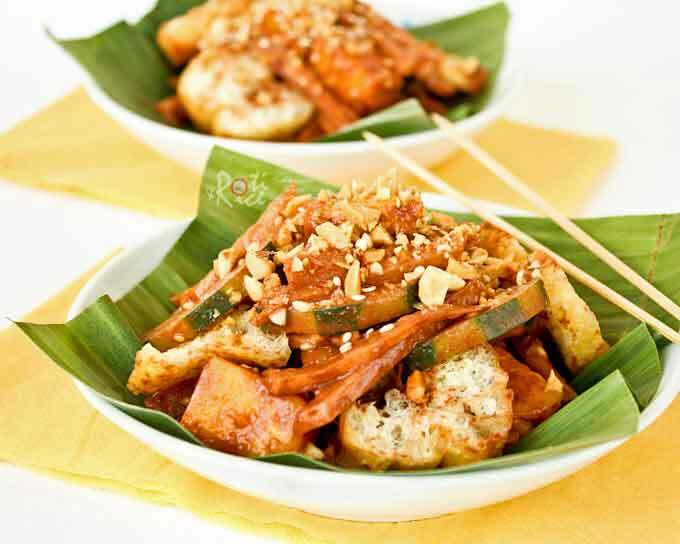 This Spicy Chocolate Rojak is a twist on the popular Malaysian spicy fruit salad using easily available ingredients for the dressing. Surprisingly tasty! This is a long winter and it shows no sign of abating in March. The produce section at the grocery stores is suffering from the prolonged season. Some fruits and vegetables while available are not at their best and prices are high. Most fruits are brought in from the Southern Hemisphere and they ripen in the box, affecting the taste. From what is available, apples, pears, and bananas are the best tasting and prices are more or less the same. Thank God for sweet clementines in January and February! From my recent posts, you have probably noticed that I am thinking of warmer climate and foods. It is fun rediscovering some of my childhood favorites and introducing them to my boys. They really enjoyed the Pisang Goreng and I had to make a second batch as teenagers have healthy appetites. 🙂 It is also very interesting to watch the expressions on their faces as they take the first bites. Though not every dish is always well accepted, it is definitely a joy when they ask for seconds. I currently have a list of foods I would like to prepare should I come across the ingredients while grocery shopping. 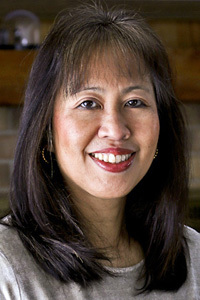 Yesterday presented me with an opportunity to recreate yet another Malaysian favorite that I have not had for a while. I was excited when I saw pineapples being sold at $2.50 each! I eyed some mangoes and jicama on the next isle and quickly made up my mind that I will try making Rojak. 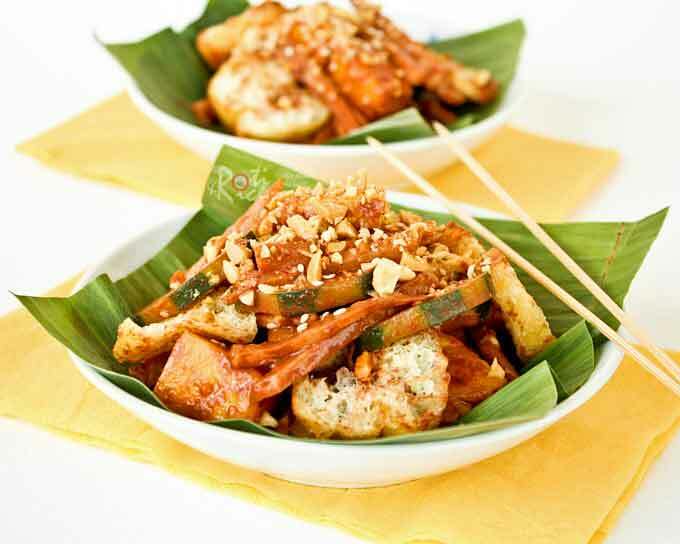 Rojak is a Malaysian spicy fruit salad consisting mainly of pineapples, green mangoes, jicama, cucumber, and deep fried tofu. The dressing is a thick, dark sauce of chili paste, sugar, dark sweet soy sauce, and shrimp paste. Most Malaysians would agree that shrimp paste, or hei ko as it is known, is a very important ingredient in the sauce. The thought of driving downtown looking for this shrimp paste and not knowing for certain if I will find it was not how I wanted to spent my afternoon. I had to come up with an alternative. When I make Chili Con Carne, I use chocolate in the sauce. Why not use dark chocolate for this rojak sauce? The color and consistency is right. There is only one way to find out if the taste is right and hence this Spicy Chocolate Rojak is my version of rojak in the west! I can’t be more happy with the results. You have to give this a try. To make the sauce, combine all sauce ingredients in a small saucepan. Cook stirring until chocolate and sugar have melted and a thick smooth sauce forms. Remove and allow it to cool. Place pineapples, mango, jicama, and cucumber in a large bowl. Pour in as much sauce as you would like. Toss to coat. Garnish with sliced tofu, chopped peanuts and sesame seeds. Cool pix! This is like a spicy fruit chocolate fondue! What a fabulous dish. I am intrigued! The sauce sounds so exotic with the chocolate and hot sauce! My brother absolutely loves Sriracha. We use it all the time! Great post, Biren! Have a beautiful weekend. This salad is like no other salad I’ve ever seen before. This is simply amazing. A salad made in heaven. Ironically, I don’t eat meat but I don’t like salads either. This is one salad I’d love to chow down on. All the ingredients sound refreshing and wonderful. There’s just something about the Asian salads that really peaks my interest. At first I thought those tofu were deep fried Chinese long doughnuts. I love the substitution you made in this sauce. You sure are a master of creations, Biren. I need to go eat something now. It’s just mean to tease my stomach with this beautiful food and not give it anything :-). Enjoy your weekend. I meant I don’t eat meat much. A fruit salad with chocolate sauce…this is something totally new and interesting to me. This is not your usual everyday fruit – love it!! So ready for warmer weather. Hey Biren, what an interesting and very creative dish. I would love to try it. Sort of like the chocolate in mole sauce. I love all your ingredients, so why not? I’m sure it was delicious. Have a nice weekend and don’t lose hope for Spring! Wow, chocolate sauce in a rojak? This is very creative of you! Now I’m ever so curious to try this! Have a lovely weekend! Biren, this was an amazing dish. Wow. I’ve never heard of it, but I love the combination of fruits and vegetables. This is so insanely inventive and looks absolutely delicious! Hmm very interesting. I’ve only ever had beef rojak with coconut milk in Malaysia. Delicious! I’m loving all the flavors going on in this dish. I can’t over the ingredients! There’s like chocolate and vegetables…haha, that’s the way to do it! I have never heard of this kind of dish before. Creative. Wow that sounds delicious. 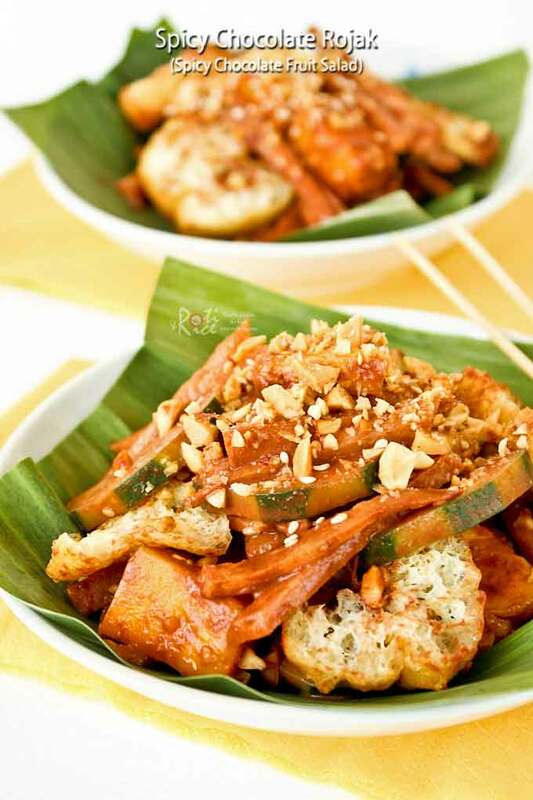 My aunt made me Rojak a few years ago and, even though the flavours were very different from what I’ve experienced before, it was simply amazing! i think it’s pineapple season, it has been on sale for a couple of weeks now. your dish sounds fantastic, love the combo between the hot sauce and chocolate and the fruit veggie selection. What an intriguing concept, I love the use of chocolate in the spicy sauce and the combination of it with the fruits! Would love to try this! wow, looks so delicious! Using chocolate is really interesting. This looks great Biren! When you mentioned adding chocolate I instantly thought of it as the asian version of Mexican mole. Stay warm out there. I just talked to my brother and he was lamenting about the cold temps and impending snow. Bah humbug. It’s time it took a hike imo. I love everything in this Biren! Adding chocolate is a delicious idea! Hey Biren, you’re so creative! Never thought choc could go into Rojak. Yummy! The addition of chocolate is so creative! Love rojak and kind of miss it too. Hey Denise, the sauce does taste like the real thing minus the shrimpy smell. That was the one thing that struck me after eating this. Now you can enjoy your rojak and still be… 😉 ROFL! Biren, this is such a clever and imaginative alternative to the shrimp paste, which my husband and kids are not fond of at all. I do have a pineapple waiting to be eaten, this would be a wonderful fruit salad to serve. Thanks for sharing!